Everyone has that one game they still remember playing for the first time. For me, it was Deus Ex: Human Revolution. Looking back, it seems weird—other games occupy my personal best-of list, but something about Human Revolution struck a distinct chord with me. It is a game I love. With the recent announcement of a new Deus Ex, I revisited the series, only to find that all was not well with the series’ last big installment. Whenever I pick a game to write about, I return and replay it at length, making mental notes about what I like and what I don’t, what works and what doesn’t. I find some sort of controlling idea, some single concept that the game does really well. I like to experiment and try to break my theory, and, if it holds up, I write about it. The weird thing is, the more I dive back into Human Revolution, the less sure I become that this game I love is actually a great game at all. On the surface, Human Revolution is a check-the-box AAA video game with unique strengths and weaknesses. Atmosphere is vital to a great game, and Deus Ex has great atmosphere thanks to one of the greatest soundtracks in video gaming history. Composer Michael McCann’s soundtrack is so good, the internet was ecstatic at the reveal that he would be returning for Mankind Divided. Also important is player choice. Deus Ex excels at supporting players in whatever way they want to play. Feeling like shooting your way through a map? Deus Ex has you covered. Want to use explosives to cause a distraction, then use the distraction to get up close and personal? Sure. Feel like hacking? Go for it—you can activate turrets, disable cameras, open new avenues of exploration, or anything else that might strike your fancy. If you want to be a ninja, cool, you can do that too—and hey, there’s even an invisibility upgrade should you tire of vents and cover as your means of stealth. Human Revolution excels in other areas, too—characters have a real sense of history and personhood in a story that’s surprisingly well-told. Most major RPGs I’ve played feature characters who are talking encyclopedia entries. Click a button, get a response. Human Revolution’s unique conversation system makes conversations more like actual conversations; rather than simply clicking on every option available or picking the obvious “paragon” or “renegade” remarks, you’re encouraged to think about what kind of person you’re talking to and how best to talk to them. Some characters, for instance, need to be buttered up. Others need harsh love. A few can be won over through charm, and so on. It’s important to be able to read the characters’ faces and make judgements about what to say. Team Bondi’s L.A. Noire attempted something similar, and it’s probably better known for its interrogations. Human Revolution pulls it off better. I can’t help but wish that everyone from Bioware to CD Projekt RED looks to Human Revolution for inspiration in the future. While the art design is strong, the maps are sometimes small and cramped, sometimes needlessly meandering. Combat needs an overhaul. The artificial intelligence is poor. The sound mix is disappointing, which hampers the game’s stealth options. Some of the writing isn’t that great. Human Revolution, in other words, suffers from some typical video game problems. Nothing major. In other words, Human Revolution is good at story, great at atmosphere, features passable gameplay, and offers a tremendous amount of player freedom. It’s got flaws, but that’s nothing new. So why does it stick with us, and where does it go wrong? The marketing for Human Revolution emphasized player choice. Choice is what the original Deus Ex was known for—heck, you could even put points into the swimming skill, which players universally agreed was useless. I just don’t think choice is what makes Human Revolution so compelling. Ask people what kind of game it is and quite a few will respond “it’s a stealth game!” That’s telling. Human Revolution offers a number of ways to play, but it sure wants you to play it as a stealth game. It might be best to say that Human Revolution wants to be a stealth RPG. Like many modern games, it doles out experience points for every completed task. There’s something in the human brain that just loves getting rewards and leveling up for doing things, and Human Revolution is all too happy to oblige. In Human Revolution, you’re equipped with prosthetic combat gear. Experience points are explained in-game as “hey, you’re getting better at using your prosthetics!” One of the best ways to get experience? Crawl in air vents. Apparently, exploring air ducts is a great way for the human body to adapt to intensive cyborg-ification. Another great way is to hack computers in order to shut down security systems (so you can sneak better), because hacking makes you better at using your cybernetic limbs. The most skilled course of action you can take, combat, is the least-rewarding path in the game. A player who shoots their way through Human Revolution will be vastly less capable by the end than the player who explores every air duct and never shoots anyone. While the game openly tells you that you can play however you want, it’s clear that there’s a preferred method of playing the game, and that method is non-lethal stealth. Most of your options are avenues for stealthy approach. You can move this heavy box to gain access to that air duct. You can hack this camera and shut it off so you can crouch-walk past that guard more effectively. In other words, what we have is less of a Deus Ex successor and more of a stealth-specific spinoff. This may sound weird, but this weakness for stealth is also the game’s biggest strength. Over the years, I’ve noticed that some of the most compelling games are those that require a significant degree of attention to the world around them. For instance, I’ve been playing Bloodborne lately, and I’ve realized that what sucked me in isn’t the combat or art design, it’s the fact that I’m actually learning about the game’s spaces. I don’t have to think so much about the maps in, say, Call of Duty, where the enemies are mostly in front of me, and all I have to do is shoot them as they pop out of cover, but in Bloodborne, thinking about the map is like 90% of all I’m doing. Alien: Isolation is much the same way, as is S.T.A.L.K.E.R: Shadow of Chernobyl, which I think is the greatest video game of all time. Paying attention to the world space is an innate quality in certain genres like platforming, horror, and, yes, stealth. At its core, a stealth game is an environmental puzzler. The player has to get from point A to point B without being detected. To successfully solve the puzzle, players have to become intimately familiar with the environment and use it to their advantage. This engages players with the game experience more deeply than simply mashing an attack button; it requires the player to become part of the game’s world, to lose themselves in the game. Human Revolution takes this a step further by presenting numerous avenues for stealth. It’s one thing to wonder how the developers want you to play the game, but another thing entirely to realize there are multiple, equal possibilities. The key to Human Revolution’s success is variety that encourages attention. The first solution might not always be the best one, so it’s best to observe the world closely. The use of experience points motivates players to pay even more attention. After all, if you get experience simply for crawling in vents, then you’re probably going to want to find every vent in the game and travel through them for easy points, though this approach is burdened with problems we’ll get to later on. Human Revolution also uses player inventory as a way of encouraging exploration; for instance, turning invisible requires energy, so you’ll have to find energy-supplying items in the world to fuel your invisibility powers. The health system requires that you carry first aid kits, rather than simply regenerate health or simply touch a health kit and get instantly healed, so you’ll want to be on the lookout for stuff to recover. Viruses can help you hack. Not only are you engaging with a space because of multiple solutions or tools to use, you’re also engaging with it because of the resources required to engage with those solutions. In other words, Deus Ex: Human Revolution is a success because it requires more of our effort and attention, which helps engage us in the experience. Once I stopped trying to play the game like it was advertised, and more like the game it actually was, I started to have a lot more fun with it. Human Revolution tries to be a game about choice that might occasionally be about a guy who runs around and shoots things, but it’s really a stealth game about choice. The more I play Human Revolution, the more I get the impression that its approach to engagement was entirely accidental. To me, Human Revolution feels like a game that imitated other, more popular games and design tropes without ever really understanding why they were there much like Eidos Montreal’s other game, Thief. This seems to be a pattern. If Human Revolution’s greatest strength is how it uses engagement to engross players in the experience, its greatest failings are the elements of its design that pulls the player out. Consider, for instance, the game’s use of the first-person perspective. Part of the reason that first-person is so popular is that it allows the audience to effectively become their player character. When a game makes frequent perspective shifts, the player’s mindset shifts as well. It’s hard to be fully engrossed in a game where you’re playing as your character one moment, and then you’re watching him do stuff the next. Imagine a game like Amnesia or Alien: Isolation switching perspectives. Not only would it be needlessly disorienting, it would also pull the audience out of the experience. Those games work best when the player processes what’s going on in the game as something that happens to them. It’s harder to do that when it’s happening to a puppet instead. Sure, it’s nice to watch someone do cool things, but isn’t it a lot better to be doing those cool things yourself? Some people will argue that they’re more engaged by third-person cameras, which is true; some people struggle with understanding their position in space-time based on sight alone. Fortunately, there’s another great reason for using the first-person perspective. When you’ve got a third-person camera, most players are going to be focused less on the environment and more on the player character—the character becomes the subject of the camera’s attention. The first-person perspective’s focus on the environment plays to Human Revolution’s strengths. Focusing on Adam Jensen rather than the environment around him works against the immersion. and Thief II are two of the best stealth games ever made. Alien: Isolation’s success is largely due to its effective use of the first-person perspective. One of the big weaknesses of third-person stealth is that it reduces stealth games to being about positioning. By that, I mean that stealth is reduced to being about ensuring that you move your avatar behind cover, then use the camera to peek out and look around. While first-person stealth is also frequently about line of sight, it engages you more deeply because you’re forced to rely less on sight (you risk being seen if you look around the corner) and more on sound. Humans are notoriously dependent on their vision, but when they really start listening to the world around them, they get a lot more engaged. If you have to track people less by absolute visual confirmation and listen quietly for where they are and where they’re going, you’re much better connected to the world around you. The third-person, cover-based stealth approach of Human Revolution once again fails to work where the first-person perspective would excel. Of course, even if Human Revolution remained entirely in first-person, we’d still have a problem. One thing that would help Human Revolution be a lot more engaging? Better sound design. Much like Thief 2014, sometimes people sound like they’re right next to you, other times, they sound as if they’re far away. When playing against the first boss in Human Revolution’s Director’s Cut version, I was struck by how he always seemed to be in one spot, even though I could clearly see him wandering around. Except, well, for the times when he got stuck. Another big problem with Human Revolution is the AI. In a good stealth game, AI drives you to be aware of your environment (notice the common theme here?) because it’s dynamic and interesting. Good stealth AI is like any good game AI: it supports the game design in question. When the AI seems like a fairly generic “patrol until alerted, explore when alerted, engage in combat or resume patrols depending on the outcome of the alert,” it renders all the choices that Human Revolution offers entirely moot. Rather than thinking “okay, the vent is the best choice for this situation,” or “hm, maybe I should hack this computer,” players are encouraged to treat the game more like a game (as in the frivolous, playful kind) rather than a tense experience where you don’t want to get caught. Also, I’ve recently noticed that blind fire, which traditionally encourages enemies to take cover, appears to do nothing in Human Revolution. Some enemies will just stand there, shooting at you. Sometimes they’ll engage in a more creative ‘duck into cover, pop up, shoot, duck,’ but that’s about it. I’ve seen more engaging, interesting AI in mods. Consider how Alien: Isolation uses the dynamic nature of the eponymous creature’s presence, combined with the shape of the levels to create a very specific, tense atmosphere. It’s flawed, but it works to create a specific feeling in its players. Human Revolution lacks that. Alien’sdynamic AI encourages environmental awareness while discouraging players from simply wandering around exploring everything. Whew. That was a lot of stuff. Deus Ex: Human Revolution is compelling because it creates a really engaging space to sneak around in, then gives you lots of ways to do it. It further encourages space engagement by rewarding players with items and experience points, using those points to unlock tools that open up the potential of more rewards. The problem is that many of the design decisions made actively work against this gameplay, whether that’s perspective shifts with the camera, the lack of emphasis on sound design, an RPG system that actively rewards ‘doing everything,’ and, of course, the poor, workmanlike AI. I think Human Revolution’s failures are the result of copying other games without really understanding why they did what they did. 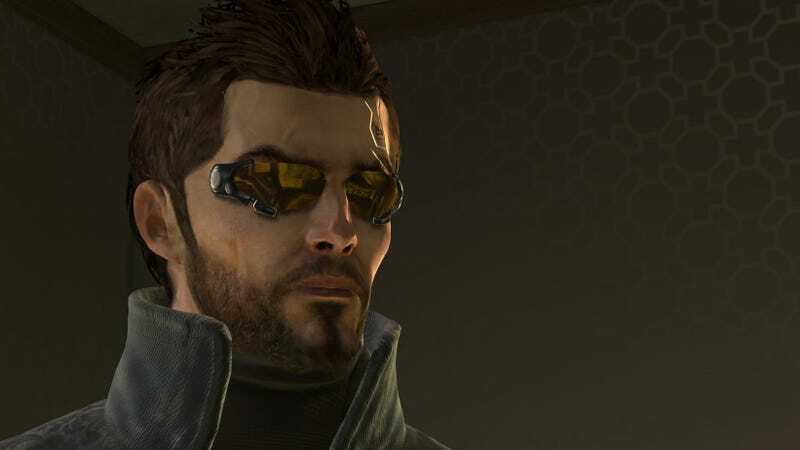 Deus Ex, originally, was about putting you in a world and letting you be the kind of person you wanted to be in it. Human Revolution imitates some of the mechanics, but doesn’t implement them in the same way. It’s the systems without any of the soul. At their best, game systems are the engines that drive the way we think and feel. A good stealth game, for instance, is engaging and tense. Human Revolution feels like a grab bag of disparate systems that never quite comes together to make a cohesive whole. Its greatest success feels more like a side effect, a spark between different systems, rather than an intended purpose. It’s weird to write about a game that I love and why it fails; despite its shortcomings, Human Revolution remains one of my favorite games. Why? Because even when a game isn’t perfect, it can still be fun. Human Revolution’s world draws me in every time; I love being there, and I can’t wait to go back.